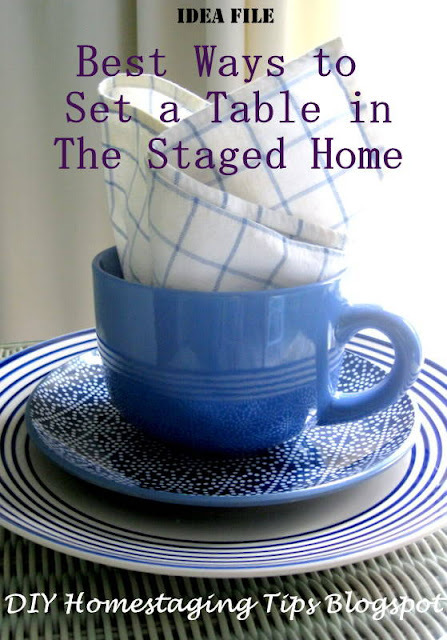 Opinions differ on whether or not to set the table with place settings in a staged home. Here's my take on the question. If you need a focal point in a dining room, gussy up the table to make it look special. But if the room has a view, a fireplace, architectural details, or other assets, your best bet is to let the table play a minor role. Do you have a nondescript or windowless dining room? Then take these tips to create a stylish tablescape that will become the focal point, giving buyers that warm and fuzzy feeling. Setting the dining table in a staged home is different from setting the table for a dinner party of your friends and family. It doesn't have to be practical, and the settings can be a little over the top. People on home tours know that buyers are putting their best foot forward, so don't think you will look like a phony. Think of tablesetting as putting on lipstick. It's obvious your lips aren't really that color, but you are telling the word, "Hey, I'm doing my best." Here's your chance to give your home that up-to-the-moment feeling. Seasonal decor indicates that your home is new on the market, even if it isn't, and that you care about and enjoy your home. Look to nature for inspiration and themes, rather than decorating for any religious or ethnic holidays. A tray with a tea cup on a bedside table? Why not? In spring, no matter where you live, flowers set the perfect tone. I always suggest silk flowers because today's good silks are very convincing, and take almost no care. I especially like to see flowers that are in season at springtime, like lilacs, tulips, pansies, forsythia, daffodils, wisteria, dogwood, violets, hyacinths, poppies, and crocus. 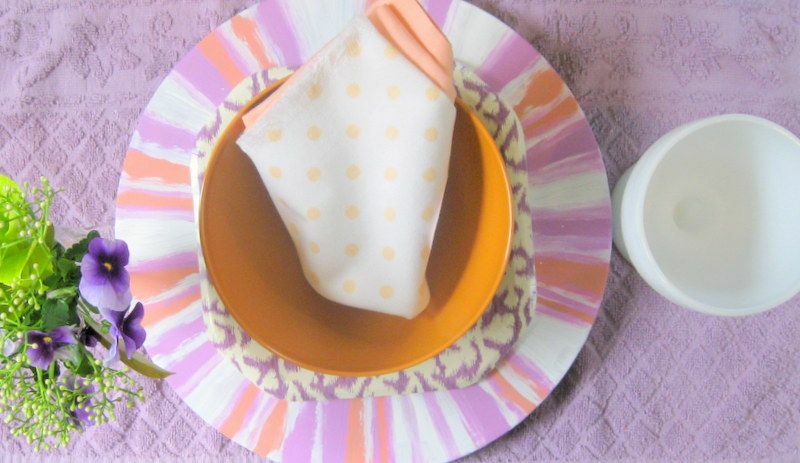 Base your tabletop settings around pastel colors in spring. Make the colors brighter in summer. Make the colors warm and muted in the fall. For Christmas and winter, choose either traditional, or simple and dramatic color schemes. a place setting. This jumbo coffee cup measures 5 inches across. Set the table with large, carefully chosen pieces for impact. You don't want buyers to be distracted by small details. You want the tablescape to look lush and abundant, but not crowded. Large serving pieces are how to get that look. Even though your table doesn't sell with the home, you can use it to get a message to buyers that there's plenty of room for entertaining. I always use all the chairs and spaces at the table, unless it looks crowded. I don't see the point of setting for four a table that will seat eight. Be on the lookout for oversized plates, glasses, and cups. Now is not the time for delicate teacups, small salt shakers, or little napkins. You can use trays for chargers, chargers for dinner plates, mixing bowls for soup bowls, and vases for goblets, for example. Dressing the tabletop is a little like dressing yourself. But instead of creating the illusion of a trim body, we want the illusion of a generously proportioned room. Your aim is to make the whole room look comfortable and luxurious. Two or three color-coordinated plates, a cup or bowl, glassware, cloth napkin, and placemat make the table look festive and well-appointed without looking fussy. 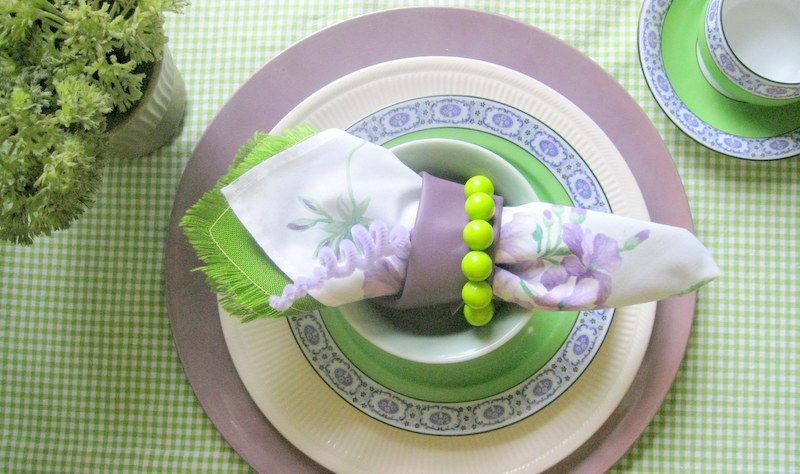 My friend Kathy, who owned a store that sold tableware and cookware, showed me the trick of using two cloth napkins, rolled or folded together, instead of one, to make place settings look more lush and layered. Try it! 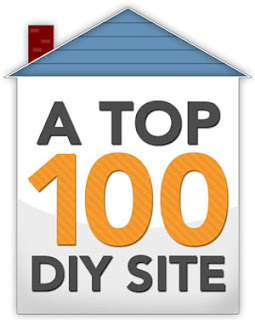 you can expect to attract, based on who your Realtor defines as your target market. Silverware of any kind is just too tempting, too easy to pocket. Sad but true, people walk off with it. Your incomplete table settings won't look as peculiar as you may think. It merely looks like the party is just getting started. Ideally, you'll have enough details on the table that silverware won't be missed. Don't count on your Realtor or other brokers to be your protector. It's just not practical to expect she can be in every room with every person when your home is being shown. paperware, the placemat is a pillow case, and the napkin ring is a shower curtain ring. For the same reason -- pilferage -- don't use anything that you prize, or that cost more than you can afford to lose. Small furnishings have been known to disappear even at open houses. It's very easy for you to find attractive dinnerware at second hand sources, or discount stores, so leave your precious silver service in the closet. 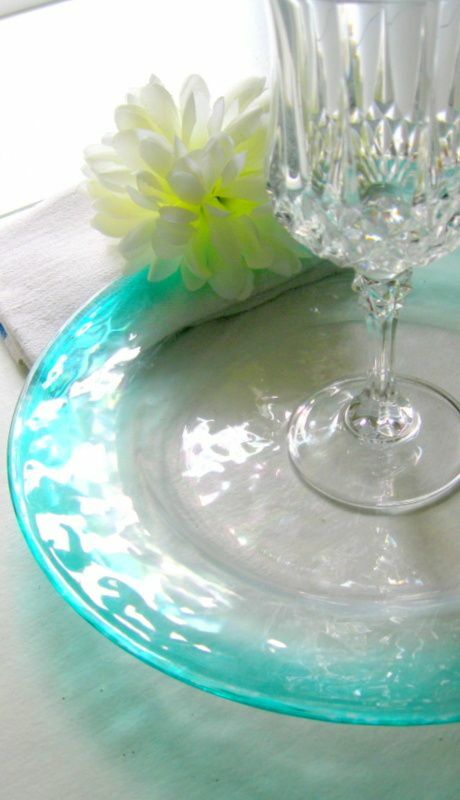 Can you believe the teal-edged plate in the top photo is cheapo plastic, and not handblown glass from Italy? If something is small enough to fit in someone's pocket, don't use it, unless you are willing to give it away. like periwinkle, plus white and silver. Simplicity is one of the guiding principles of successful home staging. Stick to a simple color scheme, one that coordinates with your room and home. 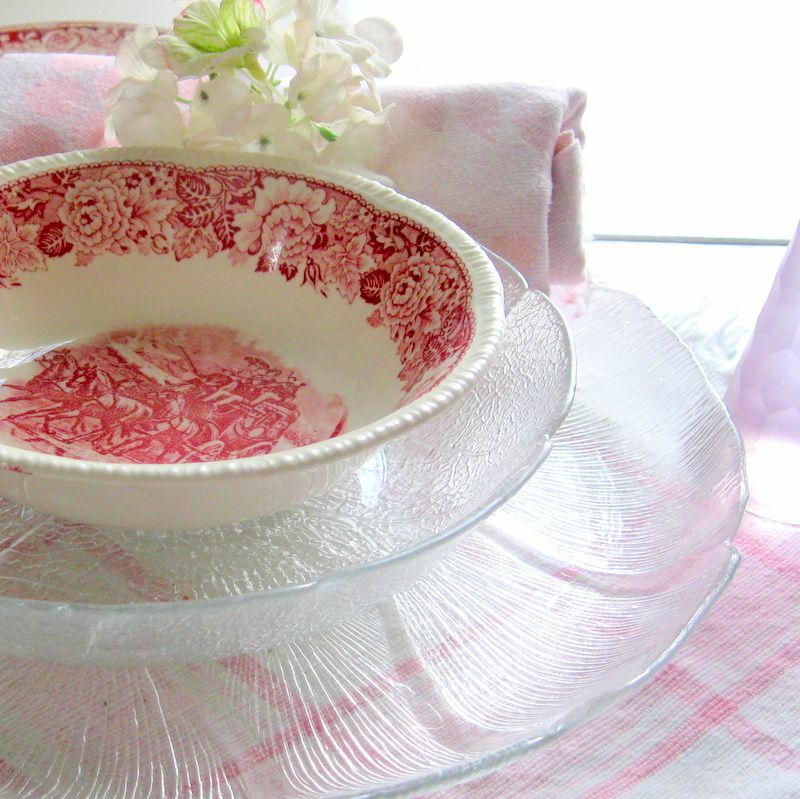 Cluster the items at each place setting, and leave plenty of breathing room between them. 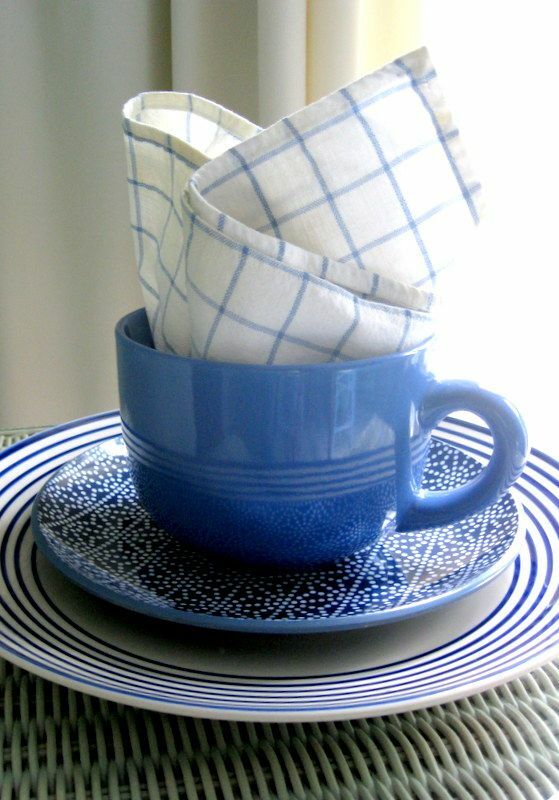 Your dinnerware does not have to match, but it should feature complimentary colors. Also, the settings should match each other, or your dining room will look like a garage sale. Aim for a variety of textures to keep things interesting. 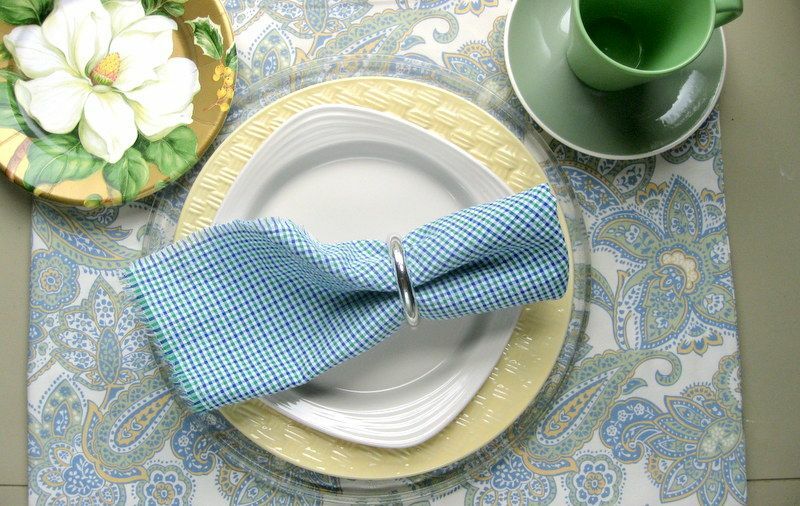 Tablecloths, no matter how pretty, colorful, or luxurious, look old fashioned. I love linens as much as the next gal, but the draped table looks like grandma's kitchen. Of course, there are exceptions. A historic home, a cute breakfast nook, an old table that needs to be disguised -- these situations may call for a cloth appropriate to the room, but generally, an undressed table looks better in the staged home. silk ones, or even a floral print fabric. Have you ever been to a home show or a model home and seen a bowl of fake popcorn, or a cherry pie or chocolate cake made from resin, or a loaf of shellaced bread? I think it's hokey and deceptive, don't you? I'm encouraging you to be decorative with your tablesettings, but not tacky. The only fake food I like to see in a staged home is a bowl of citrus fruit, because no one eats lemons. What works in the dining room, works in the eat-in kitchen, breakfast bar, deck, or anywhere there is a designated eating area. 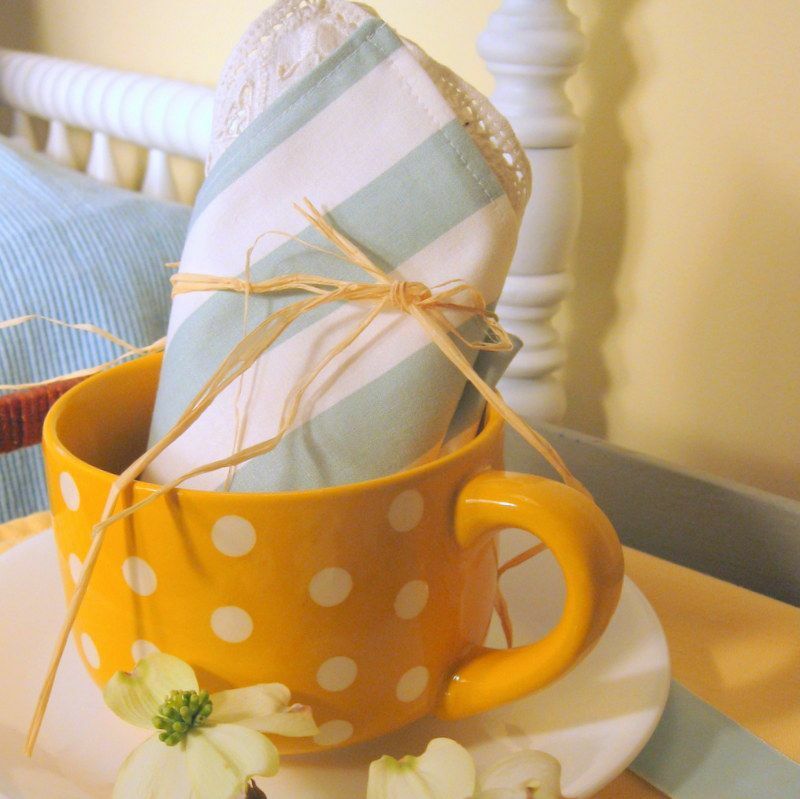 What could be more charming on a porch table than a tray set up to host a tea for two? and a scrap of vinyl for a napkin ring. It doesn't need to be complete, expensive, or elaborate, but table settings should suggest good times entertaining, relaxing, eating, and enjoying a home. 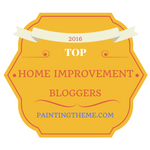 What have you done today to make your dining room and your whole home more enticing to buyers? Download my eBook, DIY Home Staging Tips to Sell Your Home Quickly and For More Money, to learn other ways to stage your own home.